Description: (From Goodreads) In Sara Moulton's Home Cooking 101, Sara helps answer that eternal question, "What's for dinner?" This must-have resource combines 150-plus all-new recipes with time-tested methods that elevate meals from everyday to extraordinary. Sara guides readers every step of the way, from including detailed instructions in every recipe to ensure the dish comes out perfectly every time to tips about selecting ingredients and balancing flavors. Bright color photographs and straightforward techniques show how easy it is to build flavors in a pan for a one-dish dinner, bake seafood in parchment for a quick healthy meal, and turn fresh seasonal produce into scene-stealing side dishes. Readers will find recipes to please every palate, including a whole chapter of vegetarian and vegan options. Enjoy fresh-tasting classics such as Sautéed Lemon Chicken with Fried Capers, Steak with Pickled Salsa Verde, and No-Knead Walnut Rosemary Bread, along with inspired new dishes such as Smashed Crispy Jerusalem Artichokes and Seared Scallop Salad with Spicy Watermelon Vinaigrette. 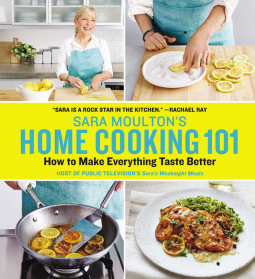 Home Cooking 101 also features contributions from some of Sara's favorite fellow chefs, including Rick Bayless, Amanda Cohen, Hiroko Shimbo, Jacques Torres, Marc Vetri, and Grace Young. Sara's signature mix of energy and warmth makes this invaluable resource a joy to cook from, proving that even a quick weeknight meal can be fun and easy. 1. 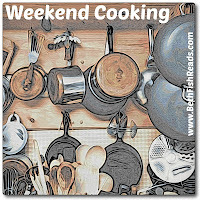 I liked the first 'chapter' on theTen Basics of a Great Home Cook. I agree with all ten points (even if I struggle with following them all myself). Well, I kind of agree, Sara says I should use the 10-inch chef knife, but I just find it too big so I'm investing in a good quality 6-inch chef knife. However, I fully agree, and have started arguments with my mother, over following a recipe correctly the first time you make it and then altering it to your tastes. 2. I liked the list of tools that she finds a must for her kitchen. I own a good portion of those and have a wish list of ones that I would like, but have no space for! 3. I haven't made anything out of this book yet, but I have plans to try some things out when I get a bit more time. I found myself bookmarking more of the recipes in the Chef's Pantry section than in the rest of the book. For my tastes, a lot of the book seemed too fussy for what I consider home cooking.